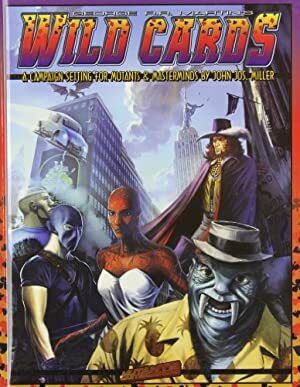 Wild Cards is a long-running series of super-hero novels, by a collective of writers. Publication started in 1987, with the ringleaders being Melinda Snodgrass and obscure writer George R.R. Martin. 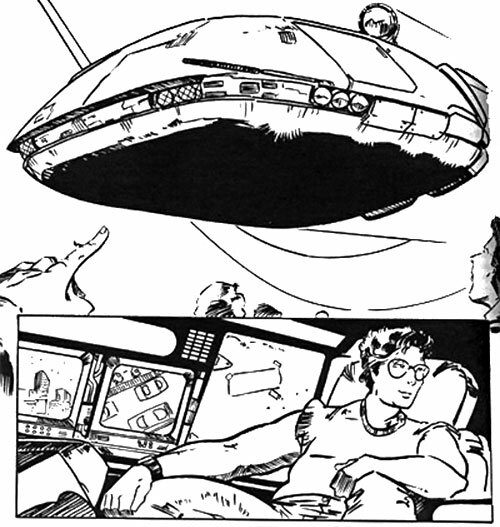 The setting and main characters come from a RPG campaign using Superworld , a early tabletop super-hero system. 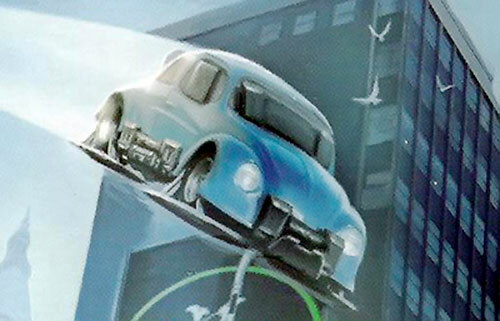 The Great And Powerful Turtle is one of the classic, early characters of the Wild Cards setting. Base Of Operations: DiAngelis Salvage Yard. The Turtle has a vastly powerful telekinetic (TK) ability, sufficient to lift a battleship. After years of practice, he has no difficulty dividing his attention between multiple tasks. For instance, he can easily float his 4-ton shell while using his TK for other things. The first four shells were constructed sequentially, with the latest one superseding the last. The fifth shell was a long-term masterpiece. It was assembled over the course of several years as Tudbury slowly acquired the best systems and carefully constructed the chassis, and had several systems the others lacked. When Tudbury was captured by the Takisians, the shell offended their leader Zabb’s sensibilities and he dumped it out the airlock. Tudbury went back to his fourth shell, which was destroyed during an assassination attempt against the Turtle by the Astronomer’s minions. After this, Tudbury was bankrupt and had lost his taste for being the Turtle. He sold the three remaining shells (his first ones) to the Jokertown Museum. On his way home, he was caught in the chaos of Typhoid Croyd’s mutated Wild Card virus. 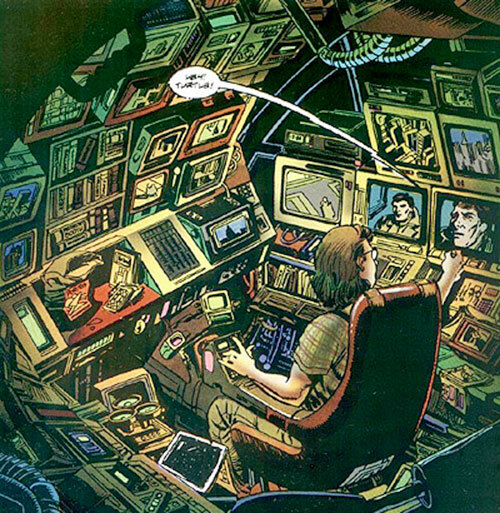 He decided that the Turtle was still needed in Jokertown and faked his own death with Tachyon’s help. With the proceeds from the sale of his shells and the life-insurance money, he built his final, best shell. Since he went into retirement after the Rox, the shell is likely in storage somewhere. Tudbury grew up in Bayonne, New Jersey, in a government low-income housing project. He was a fat, shy, only child who did well in school and poorly in sports. He was tormented constantly by his peers. A lonely, imaginative child, he spent much time in his room reading comics and playing with his pet turtles. His TK manifested quite early, but he used it mostly as a toy throughout his life, until the day President Kennedy was assassinated. This event made Tudbury realize the need for heroes to stand up for justice and the rights of the oppressed. With the help of his best friend Joey DeAngelis and inspired by his pet turtles from his childhood, he built a shell to protect himself. He has operated as the Great and Powerful Turtle ever since, jealously (some would say paranoidally) guarding his secret identity. Only Doctor Tachyon knows that the Turtle is Thomas Tudbury. But ironically, Tachyon does not know who that is or where to locate him. After Tudbury faked his own death with Dr. Tachyon’s help, he continued as the Turtle. When the Joker secessionist movement took over Ellis Island, the Turtle joined the army-led Ace task force to take back the Rox . During this time he met Danielle “Legion” Shepherd, an Ace with several psionically linked duplicate bodies. The two became romantically involved and when she was fatally maimed by an attack on one of her bodies, Tudbury snapped. He pushed his powers to the limit to create a giant tidal wave that obliterated the Rox. Tudbury subsequently discovered that some of Danielle’s bodies had survived since they were close to medical facilities. Tudbury and Danielle continued their relationship and Tudbury’s identity became public. He lives in one of Danielle’s penthouses and is more or less happy with her, though sometimes troubled by the fact that one of her bodies is married to another man. He still eschews contact with the public. This is both because he prizes his privacy and because he is uncomfortable with the many varied reactions to his destruction of the Rox. Tom Tudbury is a man of average height, slightly overweight, with curly brown hair and green eyes. He is nearsighted and wears glasses. If encountered as Tudbury he will be incredibly nondescript. He’ll wear jeans, tee-shirt, and sneakers. The Turtle is a massive four-ton armored ship roughly squared, about the height of a man. It bristles with sensory equipment, cameras, and floodlights. His newest shell was built using the insurance money from his own death. Thus, it may or may not have such esoteric devices as radar, infrared cameras, onboard computer, etc. 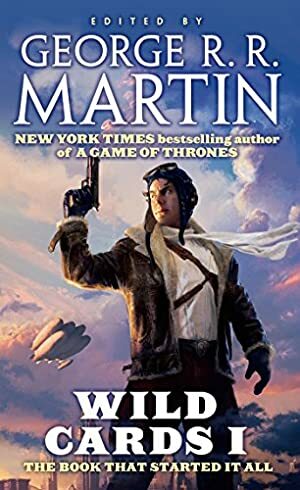 It should be noted that whenever the Wildcards books were published, their timeline was equivalent to the year they were released, and thus Tudbury would as of this writing be 57. A little adjustment is therefore necessary: either the Wildcard virus extends the average life expectancy of those infected (or at least aces) so that they remain active for much longer, or the timeline will have to be shifted forward. The Turtle has had a long public career beginning in 1963 which continues today. In 1963 he was an insecure, rather timid adolescent, full of power fantasies and melodrama. His self-appointed ace name, is an offshoot of this. By the late 80’s, Turtle is older and wiser. He has the same ideals, but they’ve been a little tarnished by experience. He’s more confident, but also more cautious. He has gone from nervous rookie to flamboyant hotdog to mildly cynical veteran. Nonetheless, he remains committed. Personality remains the same in later years, though he feels guilt over the destruction of the Rox. He is particularly disgusted by those who applaud his actions. He is more self confident due to his relationship with Danielle, but is still somewhat shy and troubled at times by the peculiarities of their romance. The Turtle is a highly effective hero in the Wildcards universe. But with a number of highly powerful supers such as Superman, etc, he would have a difficult time, as many heroes and villains would have no difficulty tearing through his shell to get to him. He is more appropriate for a low-power game, where he is a big fish in a little pond. However, Danny Chase of the Titans did something similar when he faked his own death to become Phantasm. Both of them did this to ensure their own safety while pursuing other matters. In this scenario, Chase was attacked by members of a subversive organization. But instead of remote-controlling a hockey mask and cloak to become Phantasm, he built and animated the “Turtle”, a protective shell to ensure his physical safety while leaving him free to employ his mental powers. Tudbury is more powerful than Chase, but otherwise this works. Flight represents Turtle’s ability to keep his shell aloft while doing other things – he may still use his TK to fly the shell as normal. Area Knowledge (NYC), Expansive Headquarters (Di Angelis Salvage), Popularity, Buddy (Joey De Angelis), Scholar (Comic Book History, Electronics). CIA (Keeping his ID Secret), Loss Vulnerability (No Intrinsic Range, All Powers – Tudbury can only use his TK at 0 AP’s outside his shell), Dark Secret (Faked his own death and now exists only as the Turtle), Socially Inept, Minor Physical Restriction (Nearsighted), SIA (Helping those in Trouble). THE TURTLE [BODY (Hardened Defenses) 13, Flash: 05, Sonic Beam: 06, Radio Communication: 10, Telescopic Vision: 05, Thermal Vision: 06, Full Vision: 08, Sealed Systems: 11, EMP Resistance: 10, R#2. Note : Flash Represents both Light and Sound, and is often used in an Intimidation attack]. The previous shells had /Body/ 12, and no Thermal Vision, Sealed Systems, or EMP Resistance. Otherwise, they are all much the same except for considerations of aesthetics, comfort, and updated hardware. 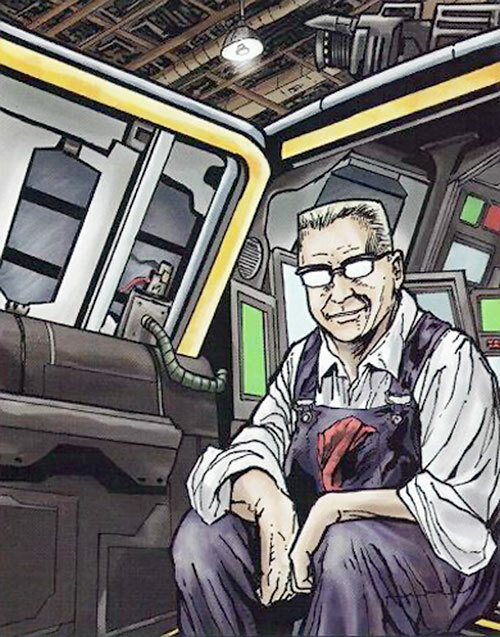 Helper(s): Roy Cowan, Peter Piispanen (For the EMP Resistance Power). 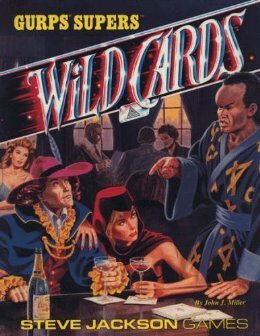 Source of Character: Wildcards Universe (books and comics), text parts paraphrased from GURPS Wildcards.